This is the text of a lecture I gave at La Trobe University on the topic of asylum seekers. the image is of my slowly emerging crochet protest banner. This is a brief account of some of the encounters and experiences I’ve had while doing ‘activist art’ around the issue of Australia’s treatment of refugees. These include documenting protest actions, making art as protest, and making art with asylum seekers inside detention centres. I’m going to show some paintings and drawings from 2005 and some drawings from this year 2013. Eight years is a long time to be working on an issue, and I have friends in the Refugee Action Coalition who have been protesting, organising, lobbying and writing for nearly 15 years. The most important aspect for me, is to observe the spatial relationships that are generated and contested through different forms of critical engagement and activism. Most important of all, is how society itself is constituted on a range of levels and through a diverse range of activities. I am interested by the space of ‘combat’ created by the protest actions around the borders of detention centres, and the spaces of sociality and engagement created by visiting inside detention centres. Both are necessary and important to the symbolic social spaces created by Australians. In a protest rally, such as the one this Saturday – the state is a bit abstract. Citizens gather in the middle of a public space to disrupt the habitual use of that space (traffic, shopping) in order to demonstrate a different form of sociality –one based on political sentiment. Marching down Swantston street doesn’t bear a direct relation to the refugees in Manus – and only a tangential relationship when some one like me sends an MMS of a photo to a friend in a detention centre. 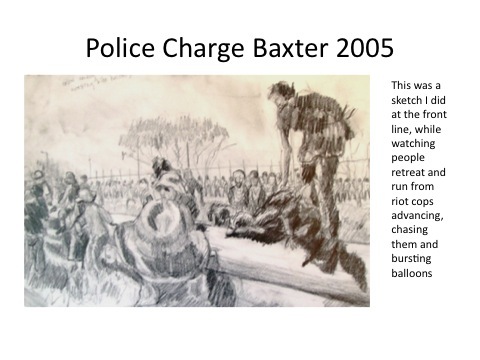 The images of the Baxter protest from 2005 came from me standing with a sketchpad in the middle of protests – watching riot cops on horseback chasing protesters across the desert in order to confiscate their kites and balloons that they were trying to fly to show the detainees that Australians cared about them. The media images that close in on cops versus protesters don’t show the absurdity of scale – that the federal response consisted of shipping a lot of riot cops to guard a piece of desert. Or that hundreds and thousands of dollars of our taxes were spent on paying thugs to burst balloons. These were the days when detainees were not allowed to have mobile phones, and they were as isolated as the current detainees on Manus are. I thought the whole thing was so obscene and absurd that I wanted to capture it in indelible materials of oil paint. My feelings about the spaces of protest and exchange were challenged last year teaching this course, when one of my students told me his parents had been in Woomera during the big protests in 2002. Suddenly asylum seekers were not ‘out there’ locked, up, hidden, remote behind razor wire, but all around me. The 90% of detainees who have been recognised as legitimate refugees, the children who were on the Tampa, who survived SIEV X and their parents, have all been living in Australia and getting on with their lives as best they can. Melbourne man, Ramesh Fernandez was also in Woomera in 2002, and he founded an organisation called RISE, which provides advocacy, assistance and space for refugees and survivors of detention centres to come together to socialise, create art, write and control of how refugees are represented. They collect and distribute food and clothing to refugees in detention and in the community. I’m not a refugee, nor are my parents, so my connection to refugees are as a racially privileged Australian. I grew up in a town that sponsored Vietnamese boat people to resettle and this is the space and form of doing Australianness that I know best and want to explore further. So this year I’ve been visiting MITA doing drawings with detainees. I received the name of an artist from a friend of a friend, and since then I’m made so many more friends. 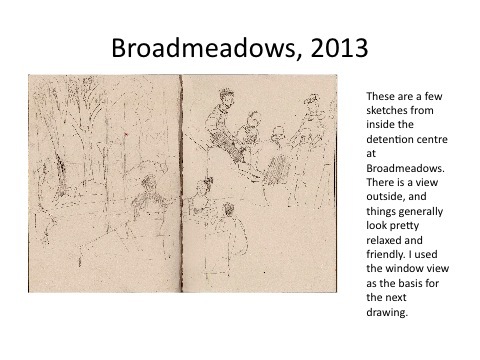 The other images are drawings done by myself or friends while visiting MITA and Villawood this year. Visitors are not allowed to take phones or cameras into the centres or take photographs outside of it. Villawood has lots of fences, everywhere, whereas MITA has fewer fences. The MITA images look ‘happy’, because they are in a social space that is friendly and convivial, and it is where detainees and visitors do our best to be brave and ‘positive’. The mandatory detention, deprivation and forms of cruelty to refugees who arrive by boat is a socially destructive act. It serves as a brutal reminder of the power of the state to arbitrate who is or isn’t a citizen, and the limits of entitlement that citizenship can provide. These include access to sanitation, healthcare and housing and education – which indigenous people in remote communities don’t have access to, and refugees in Manus island don’t either. However they also include access to social participation. To moving around a city or a country. To not undergoing constant surveillance. To having contact with a range of people within and across a society. To being able to communicate freely, and to work. To have identity papers, a drivers licence, a computer, internet access, a credit card, a phone, a camera, access to transport. To have language, and access to language classes. To have enough food and clothes so you can leave the house. To have accommodation and furniture so you have a comfortable home. Right now, in Australia, refugees are denied all of these basic entitlements to citizenship on a range of levels. Things are about to get much worse, but I want to describe what I know now, from stories I’ve heard from people I’ve met. Most boat people have no idea how horrible the boat journey from Indonesia will be. They are told that they will be fed noodles and that the journey only takes 24 hours. Usually they have no food, little water, and are stuck on dodgy fishing boats that take 4 to 5 days to make a small journey, and they are almost always too sick to eat anyway. Even my Vietnamese friends who came 32 years ago said the same. If their boat doesn’t sink and they are intercepted by the Australian navy, they are sent to Christmas Island where they are detained in a privately run gaol. This involves the confiscation of any phones, cameras and laptops they may have brought with them, and which they won’t ever see again. The Department of Immigration processes their claim. This involves liason with a case worker from DIAC, as well as a solicitor from a firm contracted by DIAC. To ‘win’ the contract for legal representation of asylum seekers, legal firms submit a tender based on their efficiency ration; ie how little time they will spend with each client in order to process their claim fastest. Asylum seekers may spend 1 month or 2 years on Christmas Island before they are transferred to a mainland detention centre. Detention centres are currently operated by SERCO – an international private security firm, and are either ‘high security’ detention centres – which are like gaols. Villawood and Maribyrnong are like this – and also house arrested criminals as well as visa overstayers. Or they are low-security ‘immigration transit accommodation’ centres, like MITA in Broadmeadows. Up until this year MITA was for single men, but now houses many children and families. I’ll talk more about MITA shortly, but they are given a uniform (blue tracksuit), food, and have access to the internet and activities, such as English classes, religious services, sport, gardening, cooking etc. From what I’ve seen, children don’t stay in detention for long (usually 1-2 months), and attempts are made by DIAC staff and caseworkers to give families community detention or bridging visas as soon as possible. When people are transferred from MITA, they are assigned to residential accommodation run by the AMES or adult migrant English service for 6 weeks. These are scattered around Melbourne, some near services, and some really far from anything. They pay $12 per night per head (including babies) from their small allowance which is 60% of newstart. They are assigned a case worker who looks for cheap rental accommodation and gets them a MYKI and Medicare card, and helps them with their asylum claim. They are required to attend regular information sessions which they sign an attendance form in order to receive their payment. This was around $200 per week, but has been reduced to 70% of newstart. After 6 weeks, they move to private rental – somewhere cheap as possible, where they continue to receive a living allowance, and children are sent to a local school. People who arrived before August last year are allowed to look for work, and some people are given free access to English classes, but others are not. So what the current policies are creating is a massive underclass of traumatised impoverished people with limited access to social participation and insertion. Refugees who are granted asylum live in conditions analogous to the thousands of ‘paperless’ refugees in Europe. The good news in all of this is how refugees and many Australians contest this isolation and anti-sociality at every level. Inside detention centres there are staff who are genuinely kind. They buy books and toys and clothes for detainees, and thank the volunteers who come to visit, and work with us to devise programs and activities for the detainees. These include day excursions to art galleries, the zoo or the bush, as well as art classes and ‘harmony day’ events inside the centre. There are also lots of officers who are cruel and petty and heartless, and apply arbitrary, irrational rules to volunteers and visitors as well as detainees. Outsiders who visit MITA are either ‘visitors’ who have a name of a detainee who they nominate on the application form, or volunteers who have gone through the screening process to be a ‘legitimate’ activity provider. I am currently in both camps, and have had the honour of meeting the hundreds of Melbournians who visit MITA each week, or each day. These include activists, students, religious groups (mostly Christian or Muslim), artists, teachers and many others. In addition many ex-detainees return to visit friends in detention, and members of refugee communities also visit detainees, and are involved in organising cultural activities for them. In addition many, many people donate clothes, toys, books, food and mobile phones to the detainees. Detainees only have the clothes they brought with them and the blue tracksuit provided by SERCO – so clothing donations go a long way towards improving peoples sense of dignity. There is an increasing need for support for refugees in the community, as it is used as a cost effective and expedient way of ‘dealing with the problem of detention – particularly of children. Many refugees are stranded in empty houses with no furniture, bedding or cooking materials and little food. So there are a number of volunteer networks linked to the visitors to MITA and to communities, who provide all of these things to refugees. In addition many volunteers visit refugees in the community and provide English conversation classes and activities. A number of recently released friends have asked me where they can do volunteer work because they are bored. I’m not extolling charity work as a be-all and end all, because ultimately the nation state should be providing these things to vulnerable citizens. However, where we have a nation state based on a zealous ideology of greed and selfishness, its wonderful to see how many people contest this on a ground level. There is a considerable crossover between people who do volunteer work for refugees and people who attend the rallies and protests and vigils such as the one this Saturday in the city. What we are doing is reminding ourselves and each other that another way of being and thinking and doing is possible and necessary.